The Soccer's World Cup 2014 organized by FIFA or also known in America as the International Federation of Soccer Association, takes place frome June 12 to July 13, 2014 when it all comes down to the grand finale! The World Cup is the largest event in the world that takes place every 4 years and 2014 will be the 20th FIFA Cup anniversary. For an entire month the world will eat, breathe, talk and sleep soccer! Everywhere you go you will here it on the radio or watch it on television. All the greats will be there: Andrea Pirlo of Italy, Franck Ribery of France, Brazil's Neymar, Argentina's Lionel Messi, Sebastian Schweinsteiger of Germany, Wayne Rooney of England or Portugal's Cristiano Ronaldo. 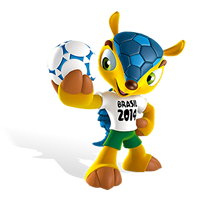 Get ready to dance the Samba with Fuleco, the mascot of the World Cup (pictured!). 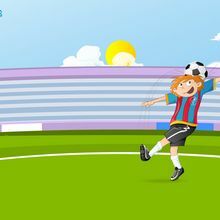 Hellokids.com has created a special Soccer's World Cup 2014 channel for you to enjoy activities, games and coloring pages of professional soccer players. Take the soccer quiz to see if you are familiar with recognizing the greatest players of each country. Have fun!